Yes, it's true. Another hot coffee case has survived a defendant's motion to dismiss the case. But, if you're a hater of the hot coffee cases, and believe that they are the paradigm of a judicial system run amok, a careful reading of the New York federal court's decision in Cacin-Worthy v. Starbuck's suggests that it's really not as bad as you might think. In this case, the plaintiff contends that she suffered serious burns when she was handed her cup of coffee by a Starbuck's employee, and the lid came off just 4 feet after she left the counter. Although the plaintiff argued that her coffee was too hot, the Court noted that she had no idea what the temperature of the coffee was when it was handed to her, and, she in fact wanted her coffee to be hot. A reasonable trier of fact could not conclude that the coffee was unreasonably hot based on this testimony alone. See Huppe, 497 N.Y.S.2d at 308 (finding that conclusory allegation that coffee was “super heated” and “too hot” was insufficient to show that “coffee was so hot that it exceeded the reasonable or customary standards for such a product”); Moltner v. Starbucks Coffee Co., 2009 WL 3573190, at *4 (S.D.N.Y. Oct. 23 2009). A reasonable factfinder could logically infer that since the plaintiff held the coffee cup without squeezing it for such a short period of time while she took three or four steps toward the milk bar, the possibility that plaintiff herself caused the lid to become unsecured is sufficiently remote. Doesn't that open the floodgates to everyone making that claim if they are injured after spilling hot coffee or tea? Not quite, said the Court. This case was different, because the lid came off almost immediately after the plaintiff was handed her cup by Starbuck's. Indeed, the Court cited to the Wurtzel and Huppe cases, where the claimants had made it out into the parking lot before the spill occurred, and in those instances, the cases were properly dismissed. 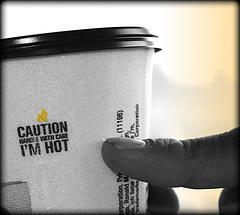 Post a Comment to "Another Hot Coffee Case Survives Dismissal in New York Court"